We put together a list of the most popular Coffee Scales. The Coffee Scales we selected range from professional Coffee house use to personal home use. 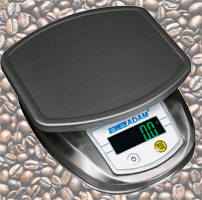 Scales to weigh coffee are 0.1 g to 1 g with a capacity of about 3000 g with a Tare function. The first thing you would want to do to get the same consist taste of your cup of coffee is to the weigh the ground coffee beans before you brew it. Don't forget you can use the Tare function to zero out the scale. The second thing some people do is weigh the water they use, winging it by using a cup will not always give you the most accurate measurement of the amount of water you are using . Remember if it is consistency you are looking for one of these scales will help you achieve that goal.